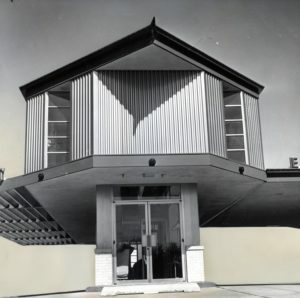 L.P. Denham, owner of Nuway Laundry, wanted his buildings to be so distinctive that they would become local landmarks. When he was ready to construct a new store in Norman in 1963, he hired architect and OU professor, Norman Byrd for the job. The result was a two-story stunner that did, indeed, become a landmark in the community. Unfortunately, Nuway closed around 2003 and the building was demolished the following year, and a Johnnie’s occupies the site now.